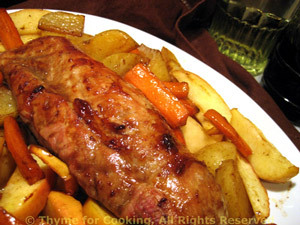 Pork Tenderloin with Potatoes, Apples, Carrots, easy New Year's Dinner. Pork and apples naturally compliment each other: the sweet-tart flavor of the apple brings out the sweetness of the pork. With roasted potatoes and carrots this is a simple meal needing little attention. Remember, slightly pink is fine for pork - and keeps it juicier. Trim tenderloin if needed, but leave whole. Cut potatoes and carrots into sticks, 1/2 X 2" (1.25 X 5cm). In medium bowl mix sugar and vinegar, stirring until sugar is dissolved. Add potatoes and carrots and toss to coat. Spread the potatoes and carrots out in a baking dish large enough to hold everything easily. Coat tenderloin with remaining vinegar/sugar and place in center of pan, with vegetables around it. Bake, uncovered, in 400F (200C) oven for 20 minutes. After 15 minutes, cut and core apple. Slice into thick wedges. Melt butter in nonstick skillet. Add apples and toss to coat well. Remove pork and vegetables from oven. Turn the pork and stir the vegetables, turning them also. Arrange the vegetables in a single layer, with pork on top of some of them, in the center of the pan. Lay the apple slices around the vegetables and return it all to the oven for the last 20 minutes. Remove, let the pork rest while you arrange the potatoes and apples on a small platter. Slice the pork and place on top. Pour over any pan juices and serve.